What is basil downy mildew? Basil downy mildew is a devastating disease that affects the leaves, branches, and stems of many types of basil (i.e., plants in the genus Ocimum) commonly used for cooking. Green-leafed varieties of sweet basil are particularly susceptible to the disease, while purple-leafed varieties of basil, Thai basil, lemon basil, and spice basil are less susceptible. Certain ornamental basils (e.g., hoary basil) appear to be highly resistant to the disease. Basil downy mildew was first reported in the United States in 2007 and has since spread widely to wherever basil is grown, including Wisconsin. include leaf yellowing (which gardeners often think is due to a nitrogen deficiency) followed by leaf browning. Affected leaves also curl and wilt, and on the undersides of the leaves, a gray-purple fuzzy material will develop. Where does basil downy mildew come from? Basil downy mildew is caused by the fungus-like organism, Peronospora belbaharii. This pathogen can be easily introduced into a garden each year via contaminated seed, on infected transplants, or via wind-borne spores (technically called sporangia). Once introduced into a garden the pathogen can spread by wind, by rain splash, or via items (e.g., hands, clothing, garden tools) that come into contact with infected plant and then are used to work with healthy plants. The pathogen thrives in humid, warm environments and can spread rapidly, decimating an entire basil crop. How do I save plants with basil downy mildew? There is no known cure for basil downy mildew. If you see basil downy mildew, harvest any asymptomatic leaves on infected plants, as well as other healthy basil plants in your garden. Use these materials immediately (e.g., to make pesto). Remove and bag any symptomatic plant remains and dispose of this material in your garbage. How do I avoid problems with basil downy mildew in the future? Avoid planting sweet basil if possible. Instead, plant other types of basil that are more resistant to basil downy mildew. If you decide to grow sweet basil, try growing the variety ‘Eleonora’ which has been bred for at least some resistance to the disease. If you grow basil from seed, check to see if the seed you are buying has been steam-treated to kill the downy mildew pathogen. Be aware however, that this information may be difficult to find, because steam treatment of basil seed is relatively new and the use of this technique is not widely advertised (at least to home gardeners). Whatever type of basil you choose, try to grow your plants in a manner that will keep them as dry as possible, thus creating an environment that is less favorable for the downy mildew pathogen to develop and infect. Plant basil in a sunny location, space plants as far apart as possible and orient rows in the direction of prevailing winds to promote good airflow and rapid drying of plants when they get wet. Avoid overhead watering (e.g., with a sprinkler) that will wet leaves and spread the pathogen; instead, use a drip or soaker hose to water. 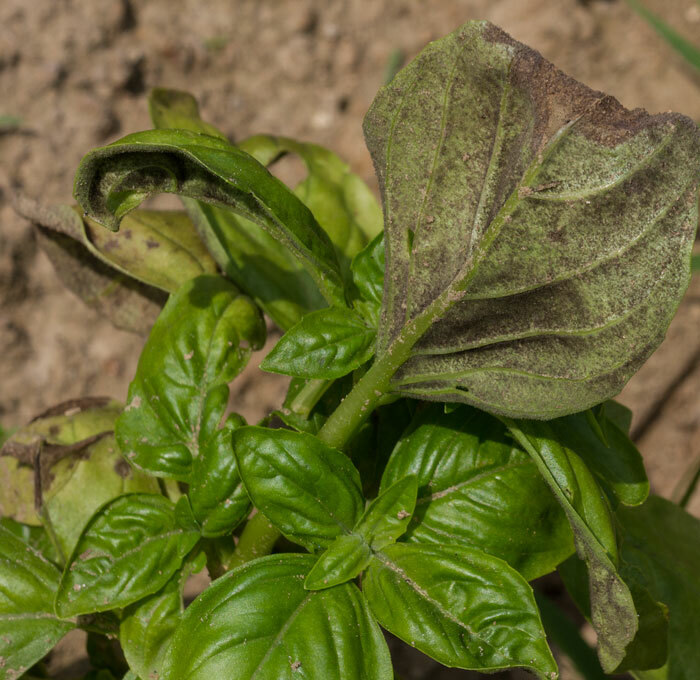 Use of fungicide treatments to control basil downy mildew is NOT recommended. Products that currently are available to homeowners, even when applied in the best manner possible, will likely not control the disease adequately, if at all. Thus using these products would be a waste of time, effort and money.